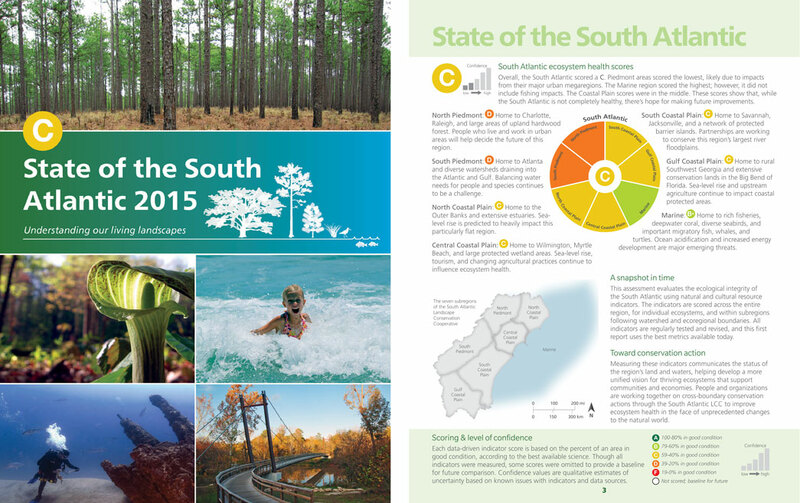 The State of the South Atlantic is a South Atlantic LCC publication designed to help us all understand our living landscapes—from hardwood forests and aquatic diversity in the Piedmont ecoregion to ships unloading freight near historic lighthouses along the shoreline. In addition to highlighting the area’s conservation successes and challenges, the State of the South Atlantic provides a report card for the current condition of our important resources. You can read about all the South Atlantic ecosystems, learn how they currently score in terms of ecological health, and read forecasts for the future. The scores are based on the measurement of key natural and cultural resource indicators, all detailed in the State of the South Atlantic. With a combination of colorful illustrations, graphics, photos and meaningful measurements, the State of the South Atlantic paints a comprehensive picture of where we live and where we stand. Is the file taking too long to load? Right click the link and select “Save link as” to download a local copy to your computer. For answers to some common questions about the State of the South Atlantic, and links to more detailed indicator information like spatial data and scores, check out the Frequently Asked Questions page.